Our marketing consulting revolves around the content calendar (and other planning and marketing management tools). If you follow me on Twitter, read the Genius! Marketing blog regularly, or purchased the Genius! Marketing book, you know that starting with tactics is not advised. It’s easy to chase tactics. The way to start is with the message, based on the brand and marketing/sales goals. One of the most important tools we use to help companies plan and execute marketing successfully is the Content Calendar. For publications, the editorial calendar is planned in advance. Magazines, broadcasters, and content driven websites plan what stories they will publish throughout the year. Yes, news happens and the content calendar plan is the same as any plan – it can and will be changed through the year as warranted by changes in the market. Still, no publication editorial board would start a year without a content calendar. It should be the same for the marketer: in the age of content marketing, the content calendar is critical; scheduling when key messages will be communicated. Organizations are publishers. With the internet, just about everyone is in the “media business.” As described in the message section of the Genius! 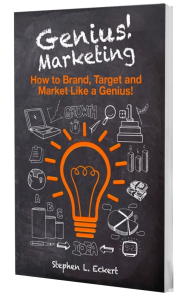 Marketing book, the website is where all the information about your company, brand, and products resides. However, this content is static. It is always available, but check the analytics of your website… not everyone (anyone) who visits the site reads the whole site. The content calendar shows how you will communicate your messages over time… it schedules the conversations to have with prospects and customers over the course of the year. Every January is the opportunity to talk about “New Year’s Resolutions” or “Things to Know – Trends for the New Year” in your industry. Some messages are seasonal… whether an industry event that occurs once per year or a product or service that is typically purchased during one time of the year. Some of the calendar “fills itself”: product launches, special sales, and the more important, obvious messages. The balance of the calendar permits plugging in the less obvious messages such as brand attributes, accessories, special warranty information, introducing key staff, or other messages that typically don’t make a headline in an ad. Those messages may be available on a website but are great to communicate through the year. The content calendar tool is critical in my consulting because it makes sure the organization is covering the topics that matter when they matter… and when there is the time in the schedule to communicate key value propositions and other messages that are not season-oriented. Not every prospect will see or hear every message but plan the schedule as if it is an ongoing conversation with prospects that support the sales process. Next blog we’ll discuss more detail on the content calendar and how it integrates to your marketing tactics like advertising, social media, email marketing, etc. Can’t wait for the next blog? Get all the information and templates including the content calendar in the Genius! Marketing book! Have a question about your content calendar or other marketing issue? Contact me!